In fact, Kathryn, I didn't know ye at all. But if I had know ye enough to have called ye "ye," believe me, a battalion of anti-semites couldn't have wiped the smile off my face! Yes, it is time to say goodbye! 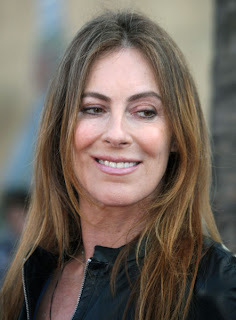 And Parting is such sweet sorrow, dear Kathryn Bigelow, 58 year old Directress of my Dreams! Especially when there wasn't any Meeting and Striking up a Charming Friendship with Intimations of Romance in the first place. Parting without first Meeting and Striking up a Charming Friendship with Intimations of Romance makes Parting all the more sorrowful, Kathryn, because there isn't any really cool stuff between the two of them to tell all your male friends about. But, oh, Kathryn, the lack of our actually ever co-existing in the same time zone never stopped us! We spoke a language known only to us --- I think it was pig latin with a touch of Yiddish. Scribes tell us, Kathryn, that you entered this world on November 27, 1951. A bare 14 months earlier, I too had made my first imprint upon the planet. How did I ever endure those barren first months of lonely existence? I was a listless child, never once seeking to set forth outside my crib. That's not totally surprising, because I didn't make it out of the crib for good until January 21, 1963, and that was only because somebody turned off The Match Game. But once I sensed deep within my soul, Kathryn, that you had joined me in this earthly realm, everything became new! I sucked my pacifier with renewed verve and intensity and continue to do so to this day! The earthly journey of two kindred spirits had begun , slowed only because I initially forgot to pack underwear. From then on, our lives paralleled each other's in every respect. I boldly pioneered new vistas in inertia, punctuated by occasional death-defying forays into the kitchen for snacks. You became a world-famous director whose life was replete with success, glory, fame, and marriage to an annoying looking guy with hair like former rock star Johnny Winter, only shorter. Despite the hectic schedules that kept us apart, when we were together, the universe could not help but smile. In fact, the universe would kind of smirk, which made you want to just smack it whenever it briefly looked away. Those moments that we were alone together! You remember those moments! No, I guess you don't remember those moments because those moments didn't exist in objective reality! But in whoever's mind they did exist (gee, wonder who it coudda been), there you were emitting sounds of such savage animalistic abandon as to make the sun, moon, and stars bewail the fact that they were not themselves sexually active. But now it's time to say goodbye. To all our company, M-I-C-K-E-Y ** M-O .... wait! I ought to be saying goodbye to you, fair Kathryn, not Mickey Mouse! I ought to be spelling K-A-T-H-R-Y-N! Actually I ought to be not doing this joke at all because only Boomers like you and I will understand it, and millenials will tune out to scan Twitter for the latest mentions of Justin Bieber. But let me shout it to the rooftops! Actually maybe I'll just shout it to the garage, I'm kinda exhausted from all this fare-thee-well rigamarolle. Kathryn, I love thee with all my heart! And also with a half dozen of my lesser organs! Did that get me anywhere with you? No? Okay, I'll get the hell out of here. But before I take my final leave, know this, fair Kathryn: I would do anything for thee! Except maybe sit through The Hurt Locker. If you really loved her, you would watch the movie. No doubt about it: I am a superficial SOB!